Dams have always held a special attraction for humans. Constructed many years ago with the purpose of supplying the population with sufficient water during the dry season they quickly turned into recreational and resting areas for families. 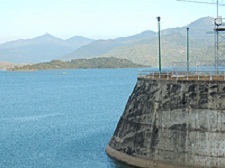 The Cajon de Pena Dam, which was built in the year 1976 and can be found in the southern part of Jalisco, is not an exception. The route to take from Puerto Vallarta is via the highway bound for Colima. After approximately one hour and 15 minutes you arrive at an intersection, where you have to turn in the direction of “El Tule”. About 20 kilometers further on you can admire the beautiful vista of the dam which holds a total capacity of 707 million cubic meters, surrounded by vegetation and offering panoramic scenery. The three seafood restaurants in the area are ready to receive visitors and their main attraction besides the regional cuisine is their friendliness. To eat there is well worth a wait of several minutes or better yet arrive before two o’clock in the afternoon in order to get hold of a good table and to sample each one of the exquisite local recipes. Here river prawns are called “shrimps” and it is a dish that you should not miss. The same is true for their fried fish (lobina and tilapia) and fresh ceviche which is prepared in two different ways: the traditional fish ceviche and the “callo” ceviche made out of the same fish but cut into square pieces. Once you are done savoring these delicacies, get ready for the obligatory boat ride offering magnificent opportunities to take pictures around the dam for a very reasonable price. 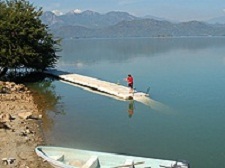 And if you feel like it you can even ask the boatman for permission to get off and explore one of the small islands formed in the middle of the reservoir. And if that is not enough, the Cajon de Pena dam as well as several of the neighboring zones provides archaeological areas for lovers of the past. In this case there are rock paintings with la Peña Pintada as the outstanding piece, a cave painting unique for Mesoamerica. 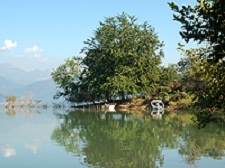 It is located north of the dam along the bank of the Tomatlan River, part of an inaccessible natural formation that is situated 12 meters above the riverbed. This rock is 40 meters high, approximately 8 meters long and 2 meters wide and is pigmented with red color. If you start your trip from Guadalajara you can head towards Manzanillo and after that city continue along the Jalisco coast until you arrive at the “El Tule” intersection, where you turn east for about 20 km.